It's time for our monthly installment of planting ideas from Karen Chapman and Christina Salwitz, the Seattle-based authors of Fine Foliage. It’s time for our monthly installment of planting ideas from and , the Seattle-based authors of . The two starring plants here ‘Silver Swan’ spurge and ‘Quicksilver’ hebe combine in one textural, climactic extravaganza for winter in our milder western climates. The fine, small-leaved blue hebe is a great underpinning of design support for the fat bracts of the spurge. The chilly blue and silvery-white winter tones are an unexpected color combination for summer as well as winter. Both are much more cold hardy than you might expect; they have come through ice storms here in the Northwest with poise. Silver Swan Mediterranean spurge, syn. 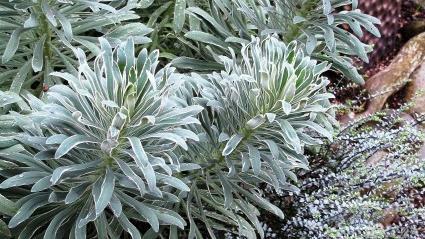 spurge (Euphorbia characias ‘Silver Swan’) is a variegated evergreen, with creamy blue-gray to almost silvery-green colored foliage with narrow white margins. Flowers bloom at the top of the bracts in early spring in a chartreuse green and hold for months. All parts of the plant are highly toxic if ingested. The milky sap may cause irritation to skin and eyes. The Royal Horticulture Society loved it SO much they gave it an award of merit! 24-30″ tall and wide in Sunset climate zones 4–24. Quicksilver hebe (Hebe pimeleoides ‘Quicksilver’) is the small plant that roars big with personality. This charming, frost-hardy hebe comes from drier mountain regions of the South Island of New Zealand. Small gray-green leaves on skinny black branches grow in a layered, feathery habit that reaches outward, wider than tall at 18″ high by 36″ wide, with small blue summer flowers. Sunset climate zones 14–24.